Remember Justea Battle of the Bands last December? This time it was inter-college BandFest on the night of May 4, 2007. Me: Am I ready... to party? Walking towards the Holt Room at UQ Union, this huge banner which was hung across horizontally above the walkway instantly caught my attention. I just thought this night would be another night to celebrate... hahaha. ...Bring it on! Bring it on! In fact, I've no idea how a bandfest might turned out to be, but without hesitation I went for it, knowing that some college-mates were there to perform on stage. The first thing I saw when entering the Holt was a bunch of people wearing some kinda plastic-looking costumes and face masks ...like the entire room has been filled with poisonous gas. The truth is that these dudes are from my college. They were among the first to perform, and I can tell you that they were simply awesome. The crowd were entertained from one beat to another higher beat, superfast tempo. Seriously there was no tune because it was all about ROCK! Some yelled, screamed, danced and shake-shake, you know. Others like Me stood upfront to take picture. A fence separated us from the band. Two of my college performers were also my wing-mates. I've only known a little of them, though. I went back early so I wouldn't have known who are the winners. My college was not even in the top three. Watch out for my next post about one of the largest multi-cultural event here in Brisbane, Australia. 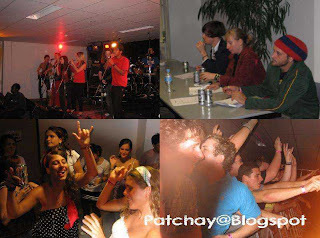 Tags: Patchay-Blogspot, college life, bandfest, rock and band. Looks like somebody's having loads of fun!! Don;t forget the alcohol! Woohoo!! Yeah see is fun... but feel no fun haha... ahmoh affair you know. Wah alcohol? I drink only if really needed.